As a mom of two littles, I only have so much time for dinner prep before things get crazy, which is why this easy recipe comes in handy. I love a good home cooked meal that delivers a lot of flavor and is ready in a hurry. Feel free to mix in any other veggies that sound good to you including mushrooms, zucchini, pepper, etc. Also, you can substitute dried herbs instead of fresh, but you will lose a lot of flavor that way. If you do use dried herbs be sure to use less (around 1-2 tsp) as they are more concentrated. I hope you and your family enjoy this quick and easy meal! Step 1: Cook ravioli according to package directions. Step 2: Drain ravioli and set aside. Step 4: In medium saucepan, sauté butter, spinach and tomatoes until spinach is wilted. Step 5: Mix ravioli, spinach mixture and fresh herbs together. Serve immediately. What’s your favorite quick and easy meal idea? I’d love to know! Drain ravioli and set aside. In medium saucepan, sauté butter, spinach and tomatoes until spinach is wilted. 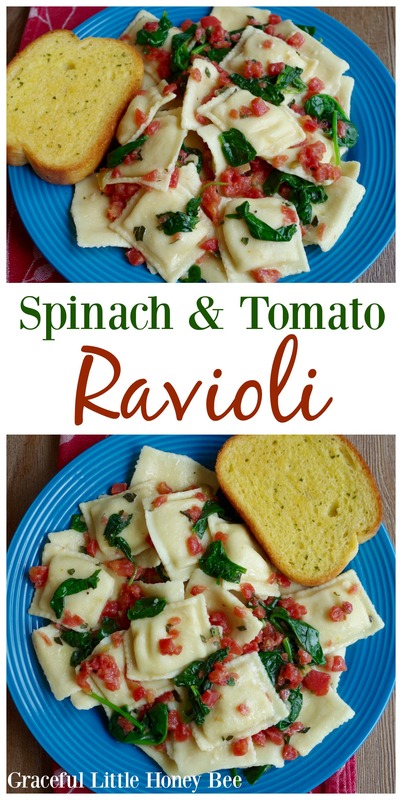 Mix ravioli, spinach mixture and fresh herbs together. Serve immediately. Very smart idea, thank you!!!!! I was wondering if I'd try steaming some chopped kale in place of the spinach.